And while the good people at FLL would have you believe getting from their airport to South Beach is as easy as hopping on and off a train, in reality it’s about as simple as hopping on and off a porcupine. 6:45 a.m. – Touchdown in Ft. Lauderdale. 7:01 – Get my bags from baggage claim. I called the good folks at Guiness to see if 16 minutes to retrieve luggage was a world record. It was not. But don’t expect this every time either. 7:03 – Arrived at TRI-Rail shuttle bus stop at the north side of Terminal 1. Three other people sat beneath the easy-to-miss sign, two of whom were airport employees . 7:16 – TRI-Rail shuttle bus arrives. It looks vaguely like a decommissioned rental car shuttle with a small, makeshift sign on it. Me and the other three passengers board. I’m the only one with an actual suitcase, which is a good thing as the bus has no place to put them and the driver seemed in no hurry to help. 7:34. – Arrive at “Ft. 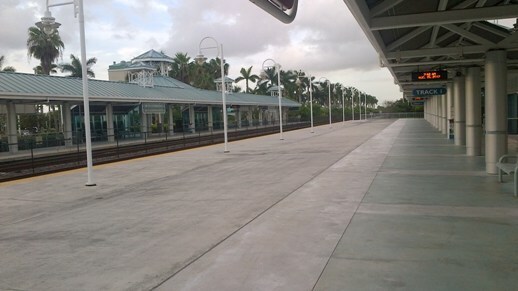 Lauderdale Airport” TRI-Rail station. The drive to the station is a 20 minute tour through some very some very unseemly sections of Dania Beach. Or, as some would call it, the part of town where they put a train station. 7:36 – Purchase tickets at the end of the platform closest to the bus drop for the southbound train to Miami Airport. The automated machines are strictly there for decoration, so just plunk down your $3.75 with the nice lady at the ticket window and ask for a 1-way to Miami. It may be the only place that does not sound shady. 7:54 – On TRI-Rail southbound. The platform looked like a prop form a ghost town, so I did not have to worry about any pesky “other people” or “sharing a seat” on the TRI-Rail. I had a section of 4 seats to myself. The ride will take you by some spectacular scenery of South Florida, provided your version of “spectacular scenery” includes automobile junkyards and housing projects. The train inexplicably slows down after the Opa-Locka station, my only guess being to give the conductor more lead time for Miami Drivers who don’t respect rail crossings. 8:39 – Bus leaves for MIA Airport. I am still the only person with a suitcase. 8:50 – Bus drops me off at Concourse E at Miami International Airport. This used to be where every bus loaded, which would have made a very easy transfer to the Miami Beach Airport Flyer ($2.35). 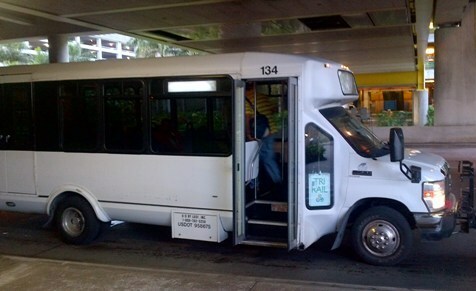 HOWEVER, now the 133 is the ONLY bus that drops off at Concourse E, forcing all others to take the new MIA Mover to the Metrobus station at the MIA Intermodal Center. Someday, around the time the polar ice caps melt and Miami is completely underwater, the TRI-Rail will go directly to the Intermodal. But not today. 8:56 – After a lengthy walk through concourse E, up an elevator, and on a moving walkway behind an old man with a cane, I JUST miss the MIA Mover to the Intermodal Center. 9:01 – I am off the MIA Mover at the Intermodal. The Flyer allegedly leaves at 9:00 a.m. I am praying for a late bus. 9:03 – Miami-Dade transit representative regretfully informs me the Flyer “just left.” I blame the old man with the cane. The rep tells me it will still be faster to wait for the next bus at 9:30 rather than take the Metrorail to downtown and take a bus to the Beach from there. 9:15 – I use the bathrooms in the car rental center. I only include this so if you end up stuck there you know the only bathrooms in the Intermodal Center are on the third floor past the Alamo counter. 9:25 – Airport Flyer leaves 5 minutes ahead of time with me on it. I’m sure the people who were stuck behind an old man with a cane on the moving walkway are infuriated. 9:32 – Flyer stops at Earlington Heights Metrorail station. This stop is not listed anywhere on any schedule, but apparently you can bypass MIA completely by transferring to the Metrorail from the TRI-Rail and picking up the Flyer here at the “95 Express” sign. 9:56 – In my car right where I left it on 24th Street. If you have three hours of your vacation you’d like to spend seeing our public transit systems, and the neighborhoods we don’t put on tourism brochures, the TRI-Rail may be a good way to get to South Beach from FLL. However, if like most you prefer to spend your vacation NOT commuting, it’s not really a viable option. My suggestion is just bite the bullet and fly to MIA if you are coming to South Beach. But if you are the type who refuses to pay more than the bare minimum for an airline ticket – other costs be damned – allow me to suggest some better options. First, you can arrange for private ground transportation though our site. Which makes for a cool, quick, comfortable trip to your hotel. Or you can take a shared ride van, which will be about $30. But be forewarned it may make 5-10 other stops on the way. So you may only beat the TRI-Rail by an hour or so. No matter what you choose, the TRI-Rail is strictly for the adventurous. 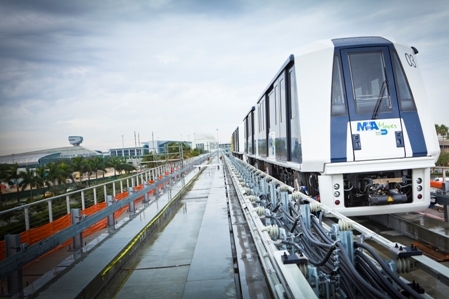 Maybe where you come from, transit from the airport to tourist destination is simple by rail. But in Miami, and especially in Ft. Lauderdale, if you don’t have a car public transport is just not an option. "TRI-Rail From FLL Makes for a Long Morning"
But just think of all the aggravation you saved yourself by not having to drive 95! Nice post, Matt, but, sadly, you won’t piss any one off with it. You mean there won’t be an avalanche of TRI-Rail devotees writing in to tell me how I don’t appreciate the subtle nuances of an American Commuter Train?! Well, then what was even the point? What do you mean 6 captchas? Rick, sorry about the Captcha system. Your not the first person to mention it sux. Our friend, rk, has also complained the system is too confusing, and that it is costing us to lose new members. Matt, great post. Thanks for taking the time to experience what the commute is like firsthand. Captcha is the test we use on the weblog and forum to make sure the comments and new members are not generated by a computer. The software we’re using is often very difficult to decipher. Thanks Gus and Michelle. What can I say, your dining room is an inspiring place to write. Great article. Your experience is just what I’d have expeceted. About 30 years ago when they announced TriRail would end out there (via SCL) rather than in downtown Miami (via FEC), I said they were nuts. I’m glad someone else agrees. I’m going through this as we speak thanks for this post and the laugh! I wanted to jump off at the metro rail but I didn’t haha waiting to get to south beach!